There is only one hotel room INSIDE all of The Magic Kingdom…the Cinderella Castle Suite. The Cinderella Castle Suite has become the dream experience for a few very lucky Disney fans and celebrities. In just a few short years, it has attained the cult-like status of exclusive Club 33 restaurant or Walt’s Apartment in Disneyland, and rightfully so, as it’s arguably more exclusive than either of those locations. Recently we had a very special guest on our show who was able to stay in the castle suite during the month of September 2013 and we know you will be super excited to hear about her experience just like we are! 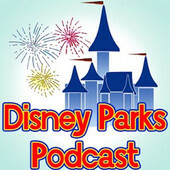 Click the photo below to be taken to this episode of the Disney Parks Podcast! Our thanks to Joanne for this wonderful interview! Podcast Meetup – News, Free Dining, Least Crowded Christmas Party Dates and More! Click here to learn more about our relationship with the Disney Parks Podcast! We want to meet you! Drinking alcohol is totally optional. Come get a soft drink or just hang out and chat! Join us for some or all of the monorail stops! Click here to go to this episode and listen in! 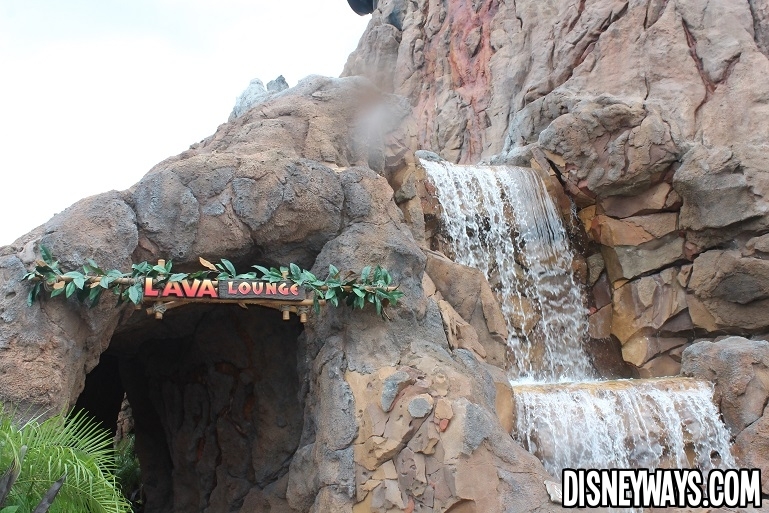 I was super excited to get to check out the brand-new Lava Lounge at Rainforest Café. Downtown Disney (soon to be Disney Springs!) fans like me will love this place. The setting couldn’t be more perfect. It’s right on the waterfront, which is something I loved. The entrance is themed like a cave entering the side of the volcano. Not your average lounge lizard – the Lava Lounge has an animatronic crocodile in the front! He wakes up every few minutes to growl and show you his teeth. The kids were standing around in awe looking at this thing. 1. There was a wait to dine inside at Rainforest Café, but at the Lava Lounge, seating is first-come, first-served. 2. Not only can you order from the full Rainforest Café menu, but there’s also a special menu featuring items created just for the Lava Lounge! With cool names for the assorted dishes such as “Volcanic Sliders”, “Tectonic Tacos”, and something called “The Jungle Runner” as a signature drink – how can you go wrong? There are lots of choices on the menu, so chances are there’s something everyone in your party will enjoy. Don’t let the “Lounge” title throw you off; it’s a space for all kinds of groups. The animals inside will be great for conversation, and may give you a chance to teach the kids something new. For even more fun, The Rainforest Café Volcano erupts multiple times each evening with a sizzling display of flame spires, fireballs, steam bursts and fog that erupts in sync with a light and sound show. It is really impressive, and you can see, hear and even feel it from inside the Lava Lounge. It’s the sort of thing you’d only expect to see at a Disney theme park…or maybe Las Vegas. Check out this cool video! So have you tried the Lava Lounge yet? What did you think? Fall 2013 Dapper Day Dates Announced!! Click here to read all about Dapper Day – what it is – what to wear and so much more! Animal Kingdom Safaris Sunday – Rhinos! I LOVE telling this story. Mama and baby were playing and running around. At one point they were headed straight for our ride vehicle! They were literally 5 feet away when they stopped dead in their tracks. Were they being aggressive? NO! Our ride vehicle was blocking the door that led to their food, and the rhinos had heard it open. Once they realized we were in the way, they politely turned to their right, walked in front of the vehicle and out of the opening that lead backstage. I don’t know how my husband kept calm enough to get these fantastic pictures, but I am so glad he did! What an awesome day at Animal Kingdom! Get all the most frequently asked questions about the New Fantasyland Expansion happening at Walt Disney World answered in about 2 minutes with this video posted by the Orlando Sentinel. Let’s hear it for short and sweet! YAY!